What is the first thing that comes to your mind when you hear the word “Workplace”? 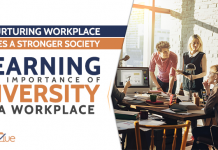 Most of us have a perception that workplace is a professional working environment where everything is organized. Unfortunately, that is rarely the case. It is common to hear stories regarding the blunders employees commit at work. To prevent the repetition of these mistakes, it is important that we learn from these mistakes. In this article, we will highlight some of the most common and biggest mistakes at work that can have a seriously negative impact on your business. Read on and find out more. There is nothing wrong in being late for work occasionally but it can have a huge negative impact if employees make it a habit. When you reach office late, you have less time to complete assigned tasks. As a result, you have to rush through these tasks to complete them before the working day ends, which could result in many errors. 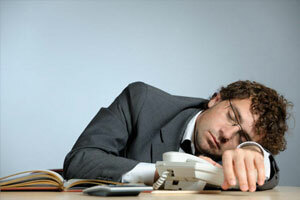 Moreover, it will have a negative impact on the overall working culture, if most employees reach office late. 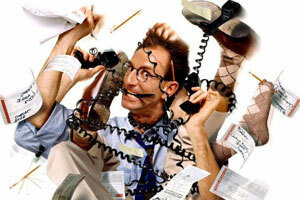 There is nothing worse for an employee’s productivity than a messy desk or workstation. With everything scattered all around the desk, it takes longer to complete even smallest tasks. 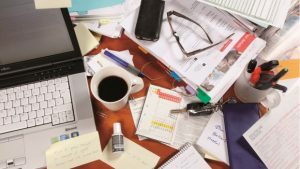 If you have a cluttered working space, then it is time to clear out the clutter and keep your neat, clean and organized to achieve higher productivity levels. A clean desk with everything organized makes a huge difference. Human brains are wired to focus on one thing at a time instead of juggling multiple tasks at once. According to a study conducted by the University of London, multi-tasking when performing cognitive tasks leads to lower IQs. In addition to this, multi-tasking increases the production of stress hormones, which leads to more stress and increases the chances of making mistakes. In short, multitasking does more harm than good to your productivity, which is contrary to the common belief most of us have. How of many of your co-workers try to take the credit of work you have done? Most of us have experienced this once or twice in our career. Did you know what does this reflect? Your team member who always uses this tactic conveys the message that he has not achieved anything substantial hence, he tries to take the credit of other’s work. This not only frustrates the real candidate who deserves the credit but also affects the credibility of the person who uses this strategy regularly. We usually link women with gossips but men are not far behind in this race. Both genders are equally responsible for spending their time in gossips and spreading the rumors. Both these habits can have serious negative repercussions for your company. Do not waste your precious time in gossips; otherwise you will never be able to achieve your targets. A famous proverb goes something like this, “A lie has no legs”. 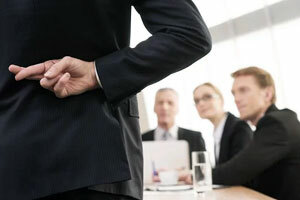 Telling a lie at work even with good intentions is not acceptable. Although, your intentions might be good but these lies will only land you in hot waters. When you are caught telling a lie, it will do irreversible damage to your self-esteem and reputation as an employee. After that, no one will trust you for anything, which is not good news for any employee. If you keep fighting with your co-workers and managers all the time, it will only result in bad things for both the employees and employers. 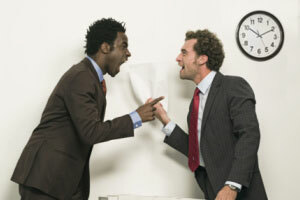 It is one of the main causes of workplace conflicts, which can derail your company from achieving its goals. Instead of being a part of the blame game, you need to work together with your team members and managers for the betterment of your organization. You could get away with a minor lapse every now and then but if you make it a habit of taking your work for granted, you could lose your job. In today’s dynamic environments, the margin for errors is diminishing hence a mistake is all your employer needs to fire you. Work with dedication and give your best instead of casually pursuing every task. If you continue to take work for granted, it will result in poor performances on a regular basis, which could result in the firing of employees. You might have come across co-workers that always live in the past. They will only tell you stories about their previous achievements and rejoice the memories. Wasting time on bragging about your past performances will not take you anywhere. Employees should have a futuristic approach and focus on the task assigned to them instead of living in the past. Sitting on your desk for hours and not taking breaks can wreck havoc on your mental and physical health. According to World Health Organization report, sedentary lifestyle at the workplace and home can take you one-step closer to death. 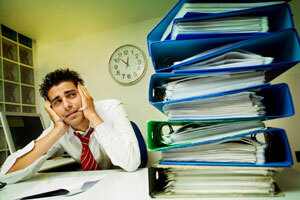 It is highly recommended that you take frequent short breaks to keep yourself energized. Get up from your desk every now and then and walk around the office to stay healthy. If you want to be a productive employee who wants to contribute towards the success of the company, then it is important that you keep your desk clean and organized and be punctual. Never try to hijack the achievement of your fellow team member or try to multitask. 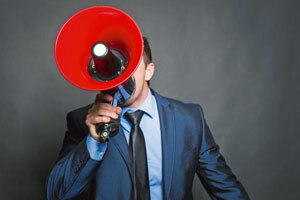 Avoid co-workers that are involved in gossiping and spreading false information. Maintain a healthy relation with everyone and do not keep top management in the dark by telling lies. 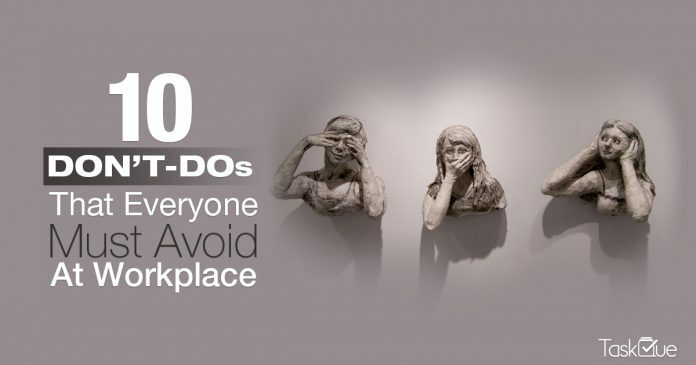 After reading this article, you might have realized how many mistakes you make at a workplace. It is time to rectify these mistakes and be an employee your employer wants you to be.